We're happy to offer our DC readers the chance to attend a free early screening of The Best of Enemies, the civil rights drama starring Taraji P. Henson and Sam Rockwell! 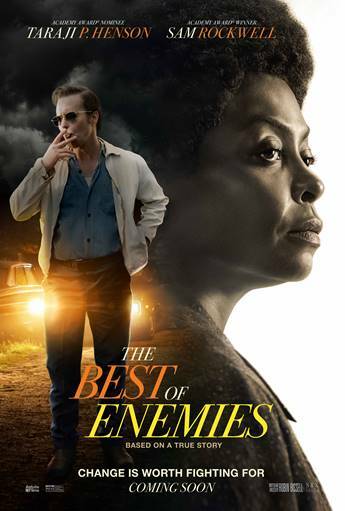 SYNOPSIS: THE BEST OF ENEMIES is a timely, inspiring drama starring Academy Award® nominee Taraji P. Henson (Hidden Figures) and Academy Award® winner Sam Rockwell (Three Billboards Outside Ebbing, Missouri). Based on a true story, THE BEST OF ENEMIES centers on the extraordinary relationship between Ann Atwater (Henson), a fearless and outspoken civil rights activist who faced off against C.P. Ellis (Rockwell), a local Ku Klux Klan leader, to blaze the way for school desegregation in Durham, North Carolina, in 1971. The screening takes place on Wednesday, April 3rd at 7:00pm at Regal Majestic in Silver Spring. If you'd like to attend, simply go the STX ticketing site here. Please remember that all screenings are first come first served and you will need to arrive early to ensure receiving a seat. Enjoy the show! The Best of Enemies opens April 5th.